Hillel used to say: He who aggrandizes his name, loses his name. He who does not increase his knowledge, decreases it. He who learns not, forfeits his life. He who makes unworthy use of the crown (of the Torah) shall pass away. And Jesus called them to him and said to them, “You know that those who are considered rulers of the Gentiles lord it over them, and their great ones exercise authority over them. But it shall not be so among you. But whoever would be great among you must be your servant, and whoever would be first among you must be slave of all. For even the Son of Man came not to be served but to serve, and to give his life as a ransom for many” (Mark 10:42-45). “About this we have much to say, and it is hard to explain, since you have become dull of hearing. For though by this time you ought to be teachers, you need someone to teach you again the basic principles of the oracles of God. You need milk, not solid food, for everyone who lives on milk is unskilled in the word of righteousness, since he is a child. But solid food is for the mature, for those who have their powers of discernment trained by constant practice to distinguish good from evil” (Hebrews 5:11-14). Bunim’s observation is correct. The Word of God is the daily sustenance for our souls. In reference to the Word being spiritual nourishment, even Yeshua himself, quoting from Deuteronomy 8:3, says that “Man shall not live by bread alone.” We are responsible for the teachings of the Holy Writ, particularly the words of our Master. Yeshua confirms this concept by saying, “Take care then how you hear, for to the one who has, more will be given, and from the one who has not, even what he thinks that he has will be taken away” (Luke 8:18). We generally associate these words of Yeshua to that of our spiritual abilities, i.e. our “talents” (from a sub-conscience association with the English homonym of the same name, rather than “talent” being correctly understood as a unit of currency). However, in this instance, Yeshua is clearly connecting this instruction with our responsibility as stewards of his teachings. His words are our very life. Peter came to this realization with his confession, “Lord, to whom shall we go? You have the words of eternal life” (John 6:68). As we stated earlier, the Word of God is life. If man does not “live by bread alone,” his existence, therefore, is sustained by the Word of God. Again, if we think about the reverse, it should bear to reason that without the Word of God in our daily diet, our lives fade from existence. “He who makes unworthy use of the crown (of the Torah) shall pass away.” The author of Hebrews says that the Word of God has the ability to discern our motives: “For the word of God is living and active, sharper than any two-edged sword, piercing to the division of soul and of spirit, of joints and of marrow, and discerning the thoughts and intentions of the heart” (Hebrews 4:12). If we are making use of Scripture for personal gain, we will be sorely disappointed in the end. Humility is occupying our proper space, neither too much, nor too little. I think this is the best definition I’ve ever heard. It makes sense on so many levels. When we break down a character trait into a definition such as this, we are able to truly define it’s parameters, rather than it being some ethereal, elusive non-tangible. Let’s explore this definition for a moment. I have had this flaw as long as I can remember. I remember when a friend of mine first brought it to my attention. His bringing it to my attention hurt me, but it was a much needed exposure of a flaw in my character that brought it to the surface in order that I could deal with it, and not be oblivious to it. However, since I was only made aware of this, and not given any tools for tikkun (repair / undoing), I still have not overcome in this. Now, I have passed it on to my children. And seeing this blemish magnified in them, it has set off internal alarms that I did not understand until recently. Having a proper definition of this middah with well-defined parameters helps me not only to better identify the breach in our family composition, but gives me a more solid means by which to correct it. Remember, “Birth is G‑d saying you matter.”2 And you really do. We all do. We all have our special role to play. And if we don’t fill up our alloted space, we are destined to fail others who are relying upon us. In this quote from the Apostle Paul, he reminds us of the exact same thing. We all have our role, and we must not only fill that role, but we must also be content with that role. “Now in a great house there are not only vessels of gold and silver but also of wood and clay, some for honorable use, some for dishonorable. Therefore, if anyone cleanses himself from what is dishonorable, he will be a vessel for honorable use, set apart as holy, useful to the master of the house, ready for every good work” (2 Timothy 2:20-21, ESV). I believe humility is the starting point for this. Once we realize the space we are supposed to occupy, we can begin filling it properly and neither spilling out onto others, nor shrinking back from our responsibilities. Are you occupying your proper space? While studying this mishnah (“saying”) from Pirkei Avot, I came across some interesting thoughts in regard to Paul, and how we might understand one of his teachings on an entirely new dimension than before. First, let me give some background. The more flesh the more worms; the more possessions the more anxiety; the more women the more witchcraft; the more maidservants the more lewdness, the more manservants the more theft. This maxim can easily stand on its own. We all realize, to some degree or another, that “less” is often “more,” and “more” is often an overdose. The main point Hillel is making here is that just because we think we need “more,” it is not necessarily a good thing. “More” can often lead to our demise. In Rabbi Abraham Twerski’s excellent commentary on Pirkei Avot, Visions of the Fathers, he expounds upon this saying through a couple of illustrations. He says that if we look at a human being we will find that he is composed of both a physical body, and a spiritual soul. Our bodies are essentially the same as any other animal, and living for our bodies as our main priority (it’s easy to find out if this is true or not, by simply looking at where we invest our time & resources) causes us to be no better than an animal. In actuality, in some ways being an animal would really be better, because animals generally don’t over-indulge. When they have eaten to their fill, they stop. Not so with humans. Too often we eat more for pleasure than for our physical needs. Animals don’t struggle with obesity. Humans do. So to primarily feed our physical bodies puts us at a level that is actually below the animal kingdom. We miss our calling of truly being human. Therefore, just as this mishnah states, we must attend to our physical needs with limitations. These things “have no limit.” They may be done “to excess.” After all, can we be too kind? Too generous? Too devout? Should we place a limit on godliness? Paul could have stopped with “self-control.” However, he concludes his list with the phrase, “Against such things there is no law.” In other words, these are things which “have no limit,” just as the corners of the field, the first-fruit offering, the pilgrimage, acts of kindness and Torah study. There should be no limit to love, nor joy, nor peace, nor kindness, nor goodness, nor faithfulness, nor gentleness, nor self-control. 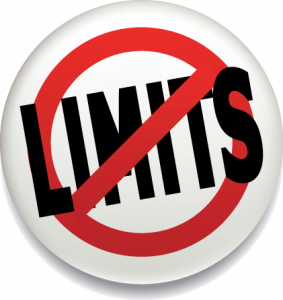 Have you been limiting yourself unnecessarily? I know I have. Are you ready to live life without limits?